Foundries are all about heat processing and working with materials at extreme temperature levels. They are essential to many sectors, such as household appliance manufacturing, building supplies, automotive and aerospace, as well as different specialised markets. Foundries produce metal castings of varying degrees of complexity. Doing this properly requires that they keep constant temperatures for processing. To do this effectively means having the right insulation to prevent heat loss while also protecting people working with intense heat. Consequently, mica-based insulation materials are essential for supporting foundry processes and sound thermal management. Our work closely ties us to this industry, where we provide a range of mica laminates and microporous insulation products to assist with foundry processes and protection. Mica has certain technical advantages for the foundry and steel industry. It extends the life of linings by acting as a superior slip plane. This means the lining has free movement through expansion and contraction, reducing the chances of cracks appearing. It also works to protect the coil grout and the furnace casting, ensuring less stress through free movement, and performing a slip plane function during the relining process. There are also financial benefits in using mica in foundries, because it can improve throughput and relining speeds while reducing downtime and the potential for expensive damage to the coil grout. Elmelin’s extensive Elmelec range of laminates includes pure mica rolls and mica ceramic or mica glass combi laminates. These mica materials offer a superior dielectric barrier and ensure optimum working temperatures across a range of foundry processes. Elmelin’s glass mica range has a robust, glass reinforcing layer, making them less prone to tearing and practical to apply even to larger furnaces. Our combi laminates are made of insulation paper ideal for furnaces melting iron and aluminium, as they help bring down the amount of power required to reach the requisite processing temperatures. They are exceptionally strong, being internally reinforced with scrim cloth of woven glass. Consistent thermal management is essential for heat processing in metal melting applications, which is why we provide products specifically designed to address key thermal management issues. Elmtherm is a high performance microporous heat insulation material. It uses micro-pores to minimise thermal transfer by convection while providing highly efficient insulation. Its infra-red opacifiers also reduce the transmission of heat by absorbing and reflecting heat radiation. At the top end of their range, Elmtherm composite materials can withstand temperatures up to 1600°C. Another key thermal management concern is safety in induction furnaces. For coreless induction furnaces, we have Elmesh, which acts as a sensor. This laminate combines stainless steel mesh and mica layers and warns where there is a danger of metal penetration close to the induction coil. It will signal when the crucible is wearing thin. 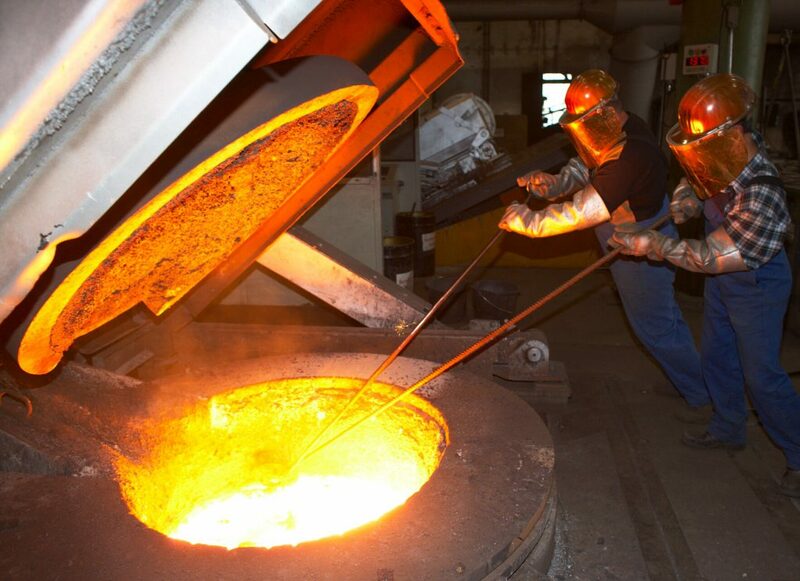 Elmesh forms part of the furnace’s early warning system and is especially useful in situations where the foundry is processing difficult materials such as scrap metal or specialist nickel alloys. Where metal vapour is deposited on the induction coil, this can lead to the build-up of zinc or other metallic residues. This can then cause short-circuits in the foundry equipment, or misreadings. Preventing this occurring is another aspect of furnace safety and efficiency. For this, we recommend Vapourshield, a mica laminate product that prevents vapour penetration. It also acts as a metal penetration alarm and barrier, triggering the advance shut-down of the furnace and preventing potentially catastrophic damage to the coil. Mica laminates provide fundamental technical support to foundries, whether at relining stage or when constructing a furnace. Elmelin has developed a range of high temperature insulation solutions, integral to the industry, along with innovative products essential for good thermal management and maintaining health and safety standards. Contact us to find out how we can provide the thermal management support you require.